My habit of late is to get up around 7:30 am, make a cup of tea, check email and Facebook, and read any interesting blogs. This morning, I saw a recipe for grape chili-pepper jelly. I wasn’t interested, both because I think grape jelly is mostly for people under the age of 10, and more importantly, I didn’t have any grapes. 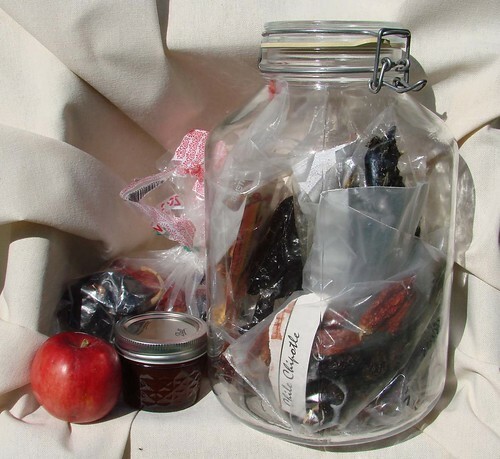 Some of these dried chilies are well past their expiration date, but how do you tell, really? What I do have is loads of apples. I’ve made apple-plum sauce, apple sauce, apple butter, and a lot of apple crisp. But still the apples keep coming. We picked the last of the tree just before our first really hard frost a few days ago. I’ve never been much of a fan of apple jelly. It’s a bit too much like grape jelly. Kind of overly sweet and one dimensional. But I do love jalapeno jelly with cream cheese and crackers. Hmmm. Inspiration! I have a lot of dried chilies of all types. 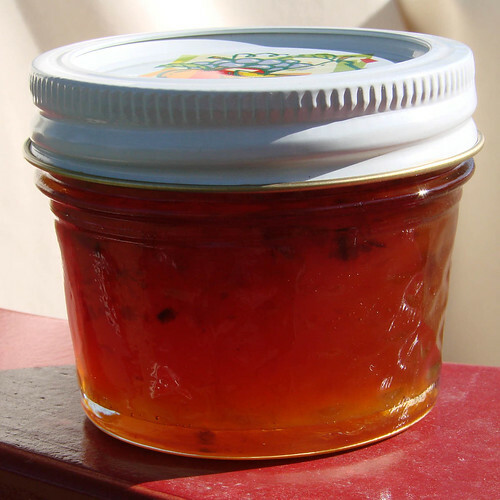 Why not an apple jelly with dried chili flakes? Checking out several recipes online, and the apple jelly and pepper jelly recipes in the Ball Blue Book, nothing quite matched up to where I wanted to go, so I ended up just winging it. Thankfully, apples are very easy to preserve due to their natural acidity and high pectin level, so I had some leeway. I wanted some vinegar for tang, and not too much sugar, as the apples were already sweet. I ran the apples, cores and all, through the food processor until pulped, then strained (and squeezed – I use the same fruit bags I use for making wine and they are pretty strong) out the juice. The jelly turned out great, with a nice but not-too-much heat and a lovely warm color. I ate the little bit that was left in the pan with some crackers and a soft cheese. Yum. What a great Christmas gift this will be. OK, a bit of an issue with the chili flakes floating up on the hot syrup before the jelly set, but as this is really a single use serving, not too much of a problem. Combine all ingredients in a heavy bottomed pan and cook down until mixture reaches the jelling point. I used a cold plate, and kept testing the mix until a few drops wrinkled when cooled and pushed with a finger. The mixture was at about 122 degrees when it was ready, but your mixture may vary depending on the apples used and the altitude. Pour into hot sterilized jars and process in a boiling water canner for 10 minutes (longer if you are not at sea level). Made 2 cups. New to canning? Please check out this site before you start. Miles Away Farm Blog © 2010, where we’re miles away from using up all the apples, but enjoying a little heat in the kitchen. In reading this, I see something about xmas gifts??? You know that your food offerings are cherished above all else with N&R? Not sure if you’re a meat eater, but I bet that would be delish with some tender red meat. I’m an opportunistic feeder. Just want to know where my meat comes from and how it was raised. Will have to try it on some pork roast. Apples and pork are GOOD friends.